WASHINGTON (Reuters) - Former Vice President Joe Biden has begun building a presidential campaign ahead of an expected announcement next month that he will vie for the Democratic nomination in 2020, sources familiar with his plans said on Wednesday. Biden has told supporters and former staff that he will run, according to one source who has knowledge of discussions. Biden and his aides also have reached out to donors and potential bundlers - people who volunteer to raise money on behalf of the candidate - to assess support, according to another source. A third source with direct knowledge of Biden's plans offered a caveat, saying the former vice president was very close to running, but "it’s not 100 percent." The sources asked to remain anonymous because of the confidential nature of the ongoing discussions. Biden all but gave away his plans last weekend when he spoke at a fundraiser in his home state of Delaware. After referring to himself as part of the field of presidential hopefuls, he corrected himself, saying instead that he could run. An official bid by Biden could profoundly shake up the sprawling Democratic field, with more than a dozen candidates already seeking to challenge President Donald Trump, the likely Republican nominee. 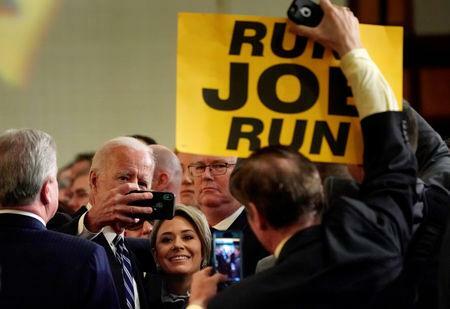 After 36 years in the U.S. Senate and eight years as vice president under former President Barack Obama, Biden will position himself as the Democratic standard bearer for a party that has moved more to the left than the last time his name appeared alone on a ballot. Public opinion polls have him as an early favorite, with nearly every measure of early support showing him leading. But he also will enter the race as Democrats debate the future of the party, with some calling for a fresh-faced liberal to move the party forward and others hoping for a centrist who can heal national divisions. At 76, Biden will be the second oldest candidate in the Democratic primary, after Senator Bernie Sanders. Biden made two unsuccessful bids for the Democratic presidential nomination, in 1988 and 2008. If Biden does jump into the race in the final days of March, he would be behind those who have already posted large fundraising totals, like Sanders and former U.S. Representative Beto O'Rourke, who each raised about $6 million their first day in the contest. Mark Putnam, a Democratic advertising and video maker who worked for Obama and several of last year's successful congressional candidates, was seen last weekend surveying scenes outside Biden's childhood home in Scranton, Pennsylvania, according to the political news website Politico. He would be a top-tier hire for Biden. Putnam crafted an ad for the unsuccessful "Draft Biden" movement that tried to convince Biden to run in 2016. His office did not respond to a request for comment about whether he is working for Biden now.